The Skills Funding Agency (SFA) is to send out tailored data return error reports in response to recommendations from the Data and Management Information Advisory Group. 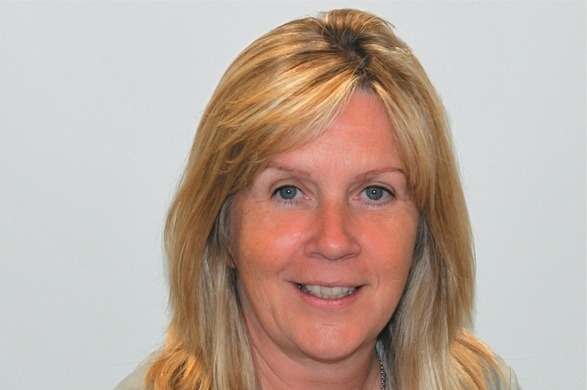 The group, chaired by Burton and South Derbyshire principal Dawn Ward (pictured), wanted the reports so providers could identify potential errors in their individualised learner record (ILR) data — used to calculate provider funding — submitted to the SFA. 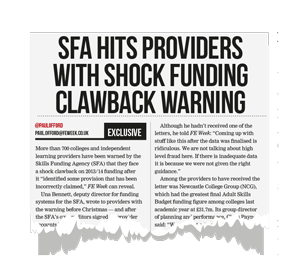 It comes after ILR data errors just before Christmas meant providers were hit with a shock clawback warning just before Christmas, as revealed by FE Week (see right). It resulted in 97 providers paying back £554k after a surprise in-year audit. However, SFA will now be sending individual ILR data reports to each provider in relation data from the 10th data return for 2014/15, R10, in a move that was announced in the SFA’s monthly data and funding newsletter, Inform. The newsletter said: “All records listed in the relevant Provider-Data Self-Assessment Toolkit (PDSAT) reports already show which errors you should review as these are identified as errors or potential errors. An SFA spokesperson said the reports would give the same information as was included in the PDSAT, but summarised into a single document — and the newsletter warned providers should still use PDSAT reports to give a detailed list of records affected by any errors. She added the advisory group had requested R10 be used instead of the more recent R11 data as “this was the last full data return (including both training organisations and colleges)”. The newsletter warned providers to review data that was listed as a “potential error” due to higher numbers of such entries than expected.